On December 21, 2016, Vojtěch Kovařič has reported a SITREP #00183 on the official Arma3 site. On December 6, 2016, Vojtěch Kovařič has reported SITREP #00182 on the official Arma3 site. The majority of the development team is currently focused on a hotfix for the recently released Update 1.66. There are a few issues we're investigating, but more on them later in this report. Aside from that, Dev-Branch is about to receive some cool additions before Christmas. All in all, everything in Arma 3 is set for a splendid winter break. ModDB, the largest platform covering modifications of various games, have once again started their Mod of the Year competition. For the next couple of days, players are able to vote for their favorite mods. Naturally, there are also Arma 3 modifications included. This is a great opportunity for all of us to send the mod teams some love and gratitude. Hurry up to send your vote on time, you too can win some prizes. Quite an unusual screenshot landed in our Twitter feed. Spanish community unit Grupo Armados conducted a Cold Invasion in Arma 3. Taking advantage of Arma 3's modability and using winter camouflage and terrains full of snow, the immersion is nearly perfect! We certainly hope everybody was served with a hot cup of tea after the operation concluded. Another Spanish group brings us to some completely different environments. From forests to dusty deserts, FO148 relies on their fierce warriors to complete various objectives. Of course, with the presence of some Splendid Camera operators, everything is documented in a set of excellent screenshots. The latest Weekly Photo shows the result of a stealth operation in our Amsterdam studio. 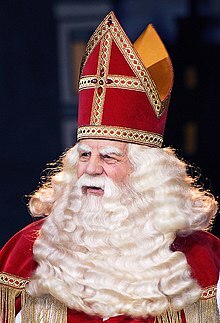 Despite heavily disadvantageous camouflage, top-tier infiltrator Sinterklaas managed to deliver a package to the very heart of our Dutch dev team, without Joris-Jan van 't Land or Karel Mořický noticing. The experience of several hundred years speaks for him, of course. We hope our Dutch colleagues enjoy the sweet delivery while setting up a more solid security system. Our colleagues over at the Project Argo team have just announced a fun little contest. To support the Malden 2035 terrain development, they are asking the community to submit designs for in-game billboards by competing in the "Create-Your-Own-Billboard" contest. It's also very relevant for Arma 3, since the Malden terrain (including the winning billboard) will be made available to the Arma 3 platform in 2017 as a free DLC (we've touched the topic in the Roadmap 2016-17 blog). The submission deadline is January 17th, and be sure to read the rules carefully and submit your own ideas to leave your mark on Malden. Unleash your inner-(m)adman, let the contest begin! As we've already hinted, we're now intensively working on a hotfix for Update 1.66 and hope to release it later this week. Shortly after the release we found out that some of the script commands ceased to work correctly. This caused severe issues for large community groups. Unluckily, even three weeks of public RC testing did not help with revealing these issues beforehand. While our QA performs a deep build test before every update, due to the complexity of the game and a relatively small size of our internal Quality Assurance team it can be very difficult to uncover and address some of these issues. We'd like to again encourage our community to provide us their feedback - both via the Feedback Tracker and social media. Thanks! One of the recent Dev-Branch additions, Dynamic Simulation, is now documented on the Community Wiki. Bringing significant improvement possibilities to community scenario makers, the feature helps to address some long-standing issues connected to the AI count on large scale terrains. Naturally, not every scenario is suitable for this, yet we hope the benefits will help make Arma 3 a more smooth and fast platform. As Dynamic Simulation is currently only available in Dev-Branch, feel free to provide your feedback on the forums. It's very appreciated! Dynamic Simulation is not the only addition appearing on Dev-Branch this December. There are several more improvements we'd like to introduce to you before the winter break. Without going into specific details, let's just say that both platform performance improvements and some playable content additions are expected. Stay tuned; our official Twitter channel and the Dev-Branch changelog thread will reveal more details Soon™. As per usual, there will be some downtime at the Bohemia offices during the winter holiday. The Arma 3 team will cease regular operations on December 16th and will come back online in January. During this period, no Dev-Branch releases are expected and the communication on social media will be less as well. Bohemia Interactive forums software will undergo an update this week. Please expect that the site will be in a read-only state for two to five days. After that, you might still see some formatting issues in some of the older posts, but those should be converted/corrected automatically over the course of the next week. Thank you for your patience and apologies for the inconvenience. Last week, the Tools received Update 1.04, introducing improvements to Binarize and ImageToPAA. Feel free to inspect the full TECHREP and provide your feedback to the dedicated forums thread. On November 22, 2016, Vojtěch Kovařič has reported a SITREP #00181 on the official Arma3 site. The development team now focuses on polishing the Release Candidate of Update 1.66 to a splendid shape. While we're still tracking quite a number of issues in the build, we're tackling the bugs one by one, and hope to release the update in upcoming weeks. Apart from fixes and maintenance, there are some additions coming in this patch, too. More on them later in this report. The 11th AMB, a Dutch realism unit, has published an epic unit promo video. In the trailer, they showcase tactical approaches on both official and community-made terrains using some clever video editing that matches the music. Great work, keep it coming! Why doesn't Arma 3 support Steam Cloud Saving? That is the question PC Gamer asked our Project Lead Petr Kolář. Simply put, while we surely recognize the benefits of having the save files backed up in the cloud, there are some obstacles we cannot really work around with our current save system. Arma 3 uses multiple save locations for several purposes (Eden Editor scenarios, Campaign saves, user settings and profile, etc.). All of this gets even more complicated when mods are factored in. To avoid compromising the platform, we've decided not to enable Steam Cloud Saving. Needless to say, if our future technology allows for a more robust solution, we'll be sure to re-evaluate the options again. Faces of War, a new World War II community mod, has reached its Alpha milestone and was released through the Bohemia Forums. The package includes a terrain, weapons, and vehicles - and more is yet to come. The authors are also looking for some talented members to join their team. Be sure to check screenshots of Faces of War and download the mod via the forums post. As we've already mentioned, testing of the upcoming Update 1.66 has started. While it focuses mostly on maintenance and stability fixes, there are some improvements which affect every step you make in the game. Senior Audio Designer Tomáš Bayer expands on the Footsteps Audio Overhaul: "We've recreated footstep sounds and their implementation basically from scratch. Most of the sounds were recorded again and were placed in separate layers. Using the SoundSet architecture, each footstep sound is now dynamically mixed from several separate sound layers being played on each step players make: boot, surface, or a random additional sound (branches in the forests, creaks on wood and others). Additionally, a Wet layer is being triggered depending on the humidity level, which, naturally, raises when it's raining. As a result, sounds of on-foot movement now provide a significantly larger diversity: chances of hearing the same footstep sound twice in a row are minimal." Many of you got excited to see Dynamic Simulation in the Release Candidate build. Unfortunately, as we've expanded on its implementation quite a bit recently, the feature requires more testing time by our QA experts and we've decided not to include it in Update 1.66. To get more Intel on Update 1.66 in general, we've started our usual communications channels. Feel free to use our official Feedback Tracker to post issues you find, reddit post for discussing the update with others and follow the RC forums thread for the Release Candidate overview and its updates. Thank you for participating! In our recent Roadmap 2016-17 blog, Creative Director Jay Crowe briefly mentioned the 64-bit client of the game. While we plan to publish a separate OPREP on the topic closer to its Dev-Branch release, some details can already be shared now. Richard Biely, one of the programmers responsible for the development, throws some of the facts on the table: "Being able to utilize virtually all your system's memory, the performance of Arma 3 should become a lot more consistent. With the ability to cache a huge amount of data, less loading is required. This translates into less work for the game to do and ultimately into more fluent gameplay. Rather than introducing a miraculous framerate increase, an improvement in the performance will be most visible when playing the game with a long view distance. The amount of data to cache is rather large in this case and the game will benefit greatly from an increased amount of available RAM." Naturally, such a great change comes with some limitations. Players will not be able to run 64-bit Arma 3 on 32-bit operation systems, or 32-bit only CPUs. Significant adjustments are also being made to the Launcher. Senior Programmer Jiří 'Wizard' Polášek is working on a proper distinction of the game versions. It is not as easy as it might seem, the Launcher not only handles the way Arma 3 is started, but it also takes care of the connection to Steam Workshop and its mod database and has to make sure proper extensions are launched along with the game. A big thank you to both Richard and Wizard for their work! Senior Programmer Krzysztof Bielawski provided a unique insight in low-level refactoring of AI behavior. His OPREP focused on the recent improvement to Arma 3, AI path-following, and explains the motivations and technical details on the path to a more reliable and natural AI driving. Since the behavior for wheeled vehicles is now fully implemented in Update 1.64, we hope to enable these improvements also for tracked vehicles on Dev-Branch soon. Last but not least, our colleagues over at Bohemia Interactive's Mobile team have enlisted more than half a million commanders in Arma Mobile Ops. To celebrate, they released the biggest update yet, with Faction Wars as the main highlight. Join either the Clouds or the Flames, and fight for victory in monthly seasons. The winning faction will of course be handsomely rewarded. You can play Arma Mobile Ops for free, so head over to the App Store (iOS) and Google Play Store (Android). See you on the leaderboards! On November 8, 2016, Vojtěch Kovařič has reported a SITREP #00180 on the official Arma3 site. The development team is now fully focusing on a clean sweep of the game. This means that for the next couple of weeks we're solely fixing bugs, focusing on performance and minor, yet long-standing issues, and polishing the game. As a consequence, all of the work is under a lock - only approved and manually selected pieces of data get in the final game and the rest has to wait until the lock is released. The plan is to finish this sweeping period by delivering Update 1.66. Hopefully, after we have results of some first build checks done by our Quality Assurance, we'll be able to publish the Release Candidate by the end of this week. The Vikings and fierce Arma warriors from the Nopryl community have celebrated their 15th anniversary in a quite unique way. Bringing their members to the wilderness of Norway and having fun by playing Arma 3 together, drinking beer, and shooting some real weapons sounds like a dream to every gamer. A video celebrating the occasion effectively sums up how great the atmosphere must have been. Thanks for the splendid montage and also for being with us right from the beginning! Truck lovers might appreciate an update video made by the FFAA mod team. In three minutes of splendid (in-game) footage, they share their progress on several highly detailed cargo vehicles. Top job, keep it up! Game Developers Session, a gaming conference for independent developers held annually in the Czech Republic, took place in the center of Prague last weekend. Bohemia Interactive developers visited and participated as a gold partner in this event in strong numbers. Our colleagues set up a Bohemia gaming booth and presented some cool new projects (more on that later in this report). Furthermore, several colleagues talked about different topics: Ivan Buchta shared some pro tips on how to make the large scale terrains that Arma and DayZ games are so famous for. And Arma 3's Project Lead Petr Kolář had an excellent talk describing the history, plot-twists and road to (and from) Early Access of Arma 3. It was nice to meet and greet other devs from all over Europe. Thanks GDS, see you next year! Bohemia Interactive is very proud to announce a new initiative for developing and experimenting with games. Bohemia Incubator aims to strengthen the spirit of creativity in our developers, while supporting current and upcoming technologies and increasing their knowledge in different areas of game development. Our own CEO Marek Španěl introduces the label in a splendid blog video. Let's take a closer look at one of the first Incubator prototypes: Project Argo. It is an experimental total conversion of Arma 3 aiming to quickly prototype competitive multiplayer gameplay and experiment with various game modes. The Open Prototype is available for free through the Bohemia Store. Feel free to inspect the official page for more Intel about the project. Being a modification to Arma 3, it of course brings some advantages even to the Arma 3 player base. Some platform improvements introduced recently to the Dev-Branch were actually benefits of this focus (e.g. Virtual Spectator improvements or character collision tweaks to name a few). Some of the benefits, however, are yet to come. The Malden island, known to the veterans of the Arma series, was chosen as a battlefield for Project Argo's scenarios. To be on par with the demands of today's technology, our Environment Designers are remaking the iconic map from scratch, using existing vanilla Arma 3 assets. As revealed in our roadmap blog, the plan is to finish the rest of the terrain (e.g. by filling the non-scenario locations with structures and vegetation) and release it as a free DLC next year as a part of an anniversary celebration of the 16th anniversary of the Arma games. Being a crucial part of Apex expansion, the Tanoa terrain consists of thousands unique objects and structures. With such a number of assets and given the time and resources we had for its development, we had recruited a fair amount of external artists to help us out with the task. One of the studios contributing heavily to delivering Tanoa on time and in a splendid shape was Black Element Software in Thailand. We thank them for all the support they provided so far! The Lead Artist on site, Zdenek Vespalec, is leaving the company to start a new adventure elsewhere. Again, as he was one of the pillars working directly on bringing Tanoa and many more aspects of Arma 3 to life, we wish him all the luck on his future endeavors! On October 25, 2016, Vojtěch Kovařič has reported a SITREP #00179 on the official Arma3 site. Coming in at the end of last week, we unveiled the 2016-17 roadmap for Arma 3. Meanwhile, the development team has started brainstorming, pre-production, and in some cases already production itself on the newly announced packages. We'll talk a bit more about the roadmap later in this SITREP, but one thing is clear: Arma 3 has a splendid future ahead of itself! We always love to see community groups organizing competitions and events for their members. One of these units, 3 Commando Brigade, recently started a "Screenshot of the Month" contest. The winners for September have been announced. Congratulations, and we hope to see more splendid screenshots in the upcoming months! Armachinima-maker GAMmovies released a cool machinima video, capturing the fate of an American tank crew during WWII. Together with some well-picked and edited music and voice-overs, the video shows what can be achieved in terms of creating atmosphere. Kudos to GAMmovies for the video, and the people behind the mods that we see making an appearance! As we briefly touched upon at the start of this SITREP, last Friday Creative Director Jay Crowe shared our long awaited Roadmap 2016-17. In the new blog, he provided a high-level outline of the planned premium packages and free platform improvements for Arma 3 in the upcoming year. We're thrilled to see the positive reception on various channels, and have been monitoring the suggestions and speculations with great interest. While some of the packages are already more strongly defined (e.g. Jets), the Tanks DLC is awaiting your suggestions on the forums (kudos to Damian90 for starting the thread). We're planning to kick off the pre-production phase of Tanks DLC in the upcoming week, and we're keen to see your thoughts on the topic! To fund our projects, the announced DLC packages, aside from the Malden Free DLC, will be premium. However, the exact pricing of every individual product will be shared closer to their release. As before, in addition to each DLC, we expect to release accompanying platform updates, which will be free for everyone. The lucky few who purchased the Arma 3 Supporter Edition in 2013 (which was exclusively available on the Bohemia Store during the Arma 3 Alpha/Beta) will also receive all these DLCs for free, as a thanks for their trust and support. We're still considering whether we'll make a new DLC Bundle available. Dev-Branch users can now use high quality lightmap textures containing ambient shadow data. Design Lead Julien Vida explains how it works, describes conditions for using the technology (such as the _adshq suffix), and finally provides a visual example in a tweet below (look for the reduction of banding artifacts). Also, ImageToPAA (part of Arma 3 Tools package) has received an update on the Tools Dev-Branch to support these textures as well. With our plans for the future now out in the open, Arma 3 is set to continue to grow in size and complexity. As you can imagine, supporting a platform with this many variables is not easy. For instance, you may have noticed that instead of every 4 to 6 weeks, Main Branch updates now occur approximately every 10 to 12 weeks. This enables us to stabilize the platform to the benefit of modding teams, while on our side, testing and supporting Arma 3 simply requires a growing amount of time (to illustrate, the 'build checklist' assembled by our Quality Assurance heroes, which we run through before every update, takes approximately three weeks). In addition, it takes into account that some of our Top Men are now also supporting the development of future Bohemia technologies and projects. As a consequence, we've also decided to change the frequency of our SITREPs. These will now appear every other week, and will hopefully contain more juicy bits of Intel. All in all, we're proud to be able to actively support Arma 3 for already more than 3 years since its original launch. This is something which has only been possible thanks to the daily cooperation with our community. We look forward to another excell... who are we kidding: splendid™ year! Korneel van 't Land has informed us that Bohemia Interactive had announced today its development plans for Arma 3 in the upcoming year. Introduced via a new post on the Arma 3 developer’s blog, the 2016-17 roadmap reveals a variety of planned DLC content, as well as post-release support in the form of free platform updates. Launching Arma 3 Apex was a big moment in our project; July’s expansion was the most significant milestone since our original release, in 2013. In the months that have followed, we've been thrilled to see our players exploring and expanding upon the new content, features, and - of course - splendid new terrain, Tanoa. Meanwhile, our team has been busy. Focusing upon both post-release support and looking ahead to the next stage of development, there’s been much evaluation, discussion, and - ultimately - the formation of a high-level plan. Now, we’d like to share our goals, highlight key updates, and talk a bit about how we’ll continue to support a mature platform in the context of planning for the future. Infantry gameplay has long been at the heart of our development. Although it remains the backbone of our sandbox, we also recognise that there are several other avenues to explore. By expanding upon combined-arms content and features, we aim to create fascinating new opportunities for our community, and attract new players looking for a gateway to a massive military experience. We're also looking to make longer-term investments (significant free updates, for everyone) that, we hope, help Arma 3 to continue to serve as platform for our community for years to come. To balance this effort - plainly speaking: to fund our project - we've prepared a number of premium packages and free updates, which translate our vision into real development. Next year, air superiority jets will fight for control over our simulated skies. More details are forthcoming but, for now, we can confirm this package will be supported by a free platform update, with radar / sensor improvements as its stand-out feature. By adding more depth to threat detection and tracking, we aim to improve gameplay across the entire sandbox. This year, we opened a new studio in Amsterdam, The Netherlands. With the goal of gradually building up experience, work has started on a small project, codenamed 'Orange'. While the exact direction isn't final, we're very much interested in exploring an interesting and unique perspective on the battlefield. It’s shaping up to be a valuable, innovative addition to the platform! June 22nd, 2017, will be Arma’s 16th anniversary. We plan to mark the occasion with a free DLC, featuring an island familiar to veterans of our series: Malden. Starting out as a small passion project, Malden 2035 re-uses many vanilla structures, vegetation, etc., to recreate this classic terrain. There’ll be an announcement related to this work in the coming weeks. Later next year, we aim to present players with a package of playable content: 'tactical operations' that focus upon challenging, replayable and authentic military gameplay, which makes the best use of our sandbox. This development is an opportunity for us to learn how to continue to support the platform, fund our project, and offer valuable new experiences for our players. We round off this roadmap with an ambitious goal: overhauling the experience of armoured combat in Arma 3. This package will follow our well-established model: a set of premium assets, which bring something new to the sandbox, supported by platform improvements and additions for everyone, for free. We encourage our community to share their own wishes on the topic, too! Traditionally, instalments in the Arma series enjoy a long tail of support and, in turn, sustain an active player-base. Arma 3 stays true to this vision. Aside from the major releases outlined above, we're also assembling a robust tools roadmap to better serve our content creators. Furthermore, we've identified several new ‘platform’ improvements not yet associated with specific updates. To provide a few examples: later this year, we'll publish 64-bit executables to Dev-Branch; work on a full singleplayer conversion of the 'Apex Protocol' co-op campaign starts soon; Tanoa structures will gradually receive additional ruins / interiors - and its splendid audio fidelity will be extended to all terrains. Naturally, we’ll discuss these things (and more!) in greater detail soon™. Associated development is planned, too. We’ll continue to provide / expand public samples and documentation. The Arma 3 Units service will enjoy some modest UX improvements. Work with our partners on experimental ports is set to continue, too. Although this roadmap seeks only to provide a high-level outline for now, we hope you’ll agree, there’s much to look forward to! This is now our third post-release roadmap. Along the way, we've gained a lot of experience about what works well, and what doesn't. For example, we know that developing across multiple studios is tough! In part, multiple packages help us to manage that risk, grow experience in autonomous teams, and, ultimately, add value to the platform in a sustainable way. We’re also looking beyond Arma 3. Indeed, some of the team have already moved onto new projects in support of the development of our next engine, 'Enfusion'. We aim to find a way to both invest in the future, and serve the diverse needs and passions of our existing community. With this roadmap, we hope to strike that delicate balance. On October 18, 2016, Vojtěch Kovařič has reported a SITREP #00178 on the official Arma3 site. The development team is polishing existing features, tackling some inconsistencies in the sandbox, and preparing for the future of Arma 3. We look forward to unveiling all of the platform improvements and content additions we have planned, and while our 2016-2017 roadmap blog is currently receiving its final touches, we intend on sharing this Intel with you in the upcoming week. Fans of the first half of the 20th century and its military may appreciate the CSA38 mod made by a Czech duo Ondřej Branžovský (who has meanwhile joined our ranks as a Junior Environment Designer) and Petr Tlach. Their creation focuses on the Czechoslovak army from the year 1938 (up until the Munich Agreement). Unique uniforms, weapons, vehicles (tanks included) and a terrain based on a real location; a bundle of content a fan of modern history simply cannot refuse. While they are still adding new assets to the package and polishing the existing ones, it already makes a very solid impression and provides tons of gameplay opportunities. Keep up the good work! Update 1.64 received a small hotfix last week to tackle some issues related to controller settings, vehicle driving, and others. Head over to the Dev Hub to read the full changelog. We recommend to verify the game's cache via Steam every time the game is updated. Last week, we asked our players to test an updated memory allocator, which we hoped would help solve sudden performance drops. Thanks to you, we already have some community test results. Sadly, the newly introduced memory allocator does not solve the issue for all players. We've collected reports of all sorts: some claiming that the FPS drop disappeared completely, and some stating that their game runs much slower than with the regular memory allocator. Thanks everyone for your reports! We'll of course keep investigating the issue. As a Game Capture Artist, you'd be helping us with the creation of various audio-visual materials. This ranges from taking screenshots, to capturing game footage for trailers and other videos, and more. While this role is not only focused on Arma 3 but all Bohemia Interactive games, basic knowledge of our titles and how to set up in-game scenarios is definitely a major plus. So, if you're an Arma 3 in-game photographer or video creator, and you'd like to make your hobby a profession (or if you know someone who fits this description), be sure to check out the details on our Careers page. Also, our new Amsterdam studio is still looking for an Encoder / Technical Artist to join its team of devs. You'd be working with our artists to bring their creations to life in our games, by configuring their properties, setting up technical model components, tuning animations, prototyping features, tweaking behaviors, and much more. Whether you're an artist with interest in the technical aspects of the work, an Arma modder with knowledge of our technologies, or a junior programmer with multi-disciplinary experience in the creation of full games in another engine for example - check our job listing for all the details and application form! On October 11, 2016, Vojtech Kovaric has reported a SITREP #00177 on the official Arma3 site. We're approaching another important step in the post-release support of Arma 3 and the finalization of the roadmap for the upcoming year. The development team has been busy outlining the future products, starting the pre-production phases, and brainstorming within the departments. Aside from that, a hotfix to the game is in the works; we hope to release it very soon if things go well. While progress on Arma 3 might not always be visible to public eyes, plenty of new exciting things are happening behind the curtains. We can't wait to start sharing bits of Intel in the upcoming weeks. Community contributor (and author of the Community Guide Videos) Dslyecxi shows off his video recording and editing skills in spectacular footage he shared over on Twitter. Observing an operation from the spectator's point of view, both organizational and fighting skills of the hardened ShackTac Unit members are tested. They proceed to withdraw from an Area of Operation on Tanoa swamped by enemy soldiers controlled by AI. A glorious firefight during a pitch-black night reminds us how atmospheric Arma can be. Good luck on the next deployment, soldiers! We always love to see unexpected and original additions to Arma 3. Operation: Trebuchet, a modification to Arma 3 inspired by a famous game series, has its first public version available on the Steam Workshop. Focusing on the perspective of a human vs human clash (no aliens here!) and introducing several assets inspired by the original games, the mod developers explained their further motivations in a dedicated reddit thread. Furthermore, a splendid trailer video was released on YouTube. Congratulations on the release and keep up the good work! The latest Weekly Photo captures the Council of Leads before a long and (as you can tell from the faces) very serious meeting. As we have the plans for the game's future narrowed down, the department and project leads gathered to incorporate some last minute iterations and adjusted the plan before presenting it to our community. Also, we've discussed our cooperation on a company level (e.g. timing with other projects), something which proved necessary in a fast-growing company like ours. One of the recent Dev-Branch changelog entries informs the players about the removal of certain memory allocators. After a broader discussion within the programming team, we have decided to discontinue support of several memory allocators from the game distribution on Steam. These (TCMalloc_bi, NedMalloc_bi, JEMalloc_bi, tbb3malloc_bi) were not loaded to the game by default; players needed to use a special start-up parameter (-malloc=). The reason we decided for this approach is rather pragmatic: we simply could not support all of the allocators properly and guarantee Arma 3's stability on other than the default allocators (tbb4malloc_bi, JEMalloc_bi). While the game is still able to load any allocator it is commanded to via the start-up parameter, the clarity of what we officially support and what is an experimental (and potentially unstable) solution will hopefully prove beneficial both for player experience on the one side and issue solving by the developers on the other side. One optimistic piece of news is the potential progress in our investigation of the infamous "3FPS Drop" issue. Some players who were experiencing drastic performance drops, and were forced to restart their game, are now reporting that the issue was resolved for them by using the newest memory allocator distributed in the Profiling Branch of the game. This is why we would like to ask you, the community, to help us confirm the fix is actually working and no side issues are present. Those experiencing the issue and willing to participate on the test, please visit the dedicated forums thread created by Yours Truly and follow the instructions given within the post. It's crucial for us to have the fix confirmed by more people, so we can decide to release it in the form of a hotfix afterwards. After the Audio Engine and Revive public documentation iterations, it's time for us to deploy our next promised update to the documentation. The Visual Upgrade documentation on the Community Wiki consists of an explanation, samples and notes on how to set the proper lighting parameters after the shaders were overhauled in Update 1.60. Apologies and a big thank you to those who waited for what turned out to be quite a complicated effort. Several iterations, adjustments and overhauls were needed before we were happy with the documentation and decided to publish it on the Community Wiki. There certainly is more room for improvements and iterations from our side. We hope to document several aspects (such as the CAWorld or LightingNew classes) into more detail some time in future. As always, we're eager to hear your feedback; be sure to leave a comment on the forums. On October 4, 2016, Vojtech Kovaric has reported a SITREP #00176 on the official Arma3 site. The development team is currently evaluating reports from players who have experienced issues after the release of Update 1.64. To address the most problematic issues, we're preparing a small hotfix to the game. However, since some of the planned changes require thorough multiplayer testing, we will not yet be able to release the hotfix this week. Arma 3 Units celebrated an important milestone last week. One of its groups, Hostile Takeover, now has more than 1000 members! As it is the first Arma 3 Unit to reach such a high number, we send our congratulations and hope to see another thousand soon. There are plenty of Units already; be sure to check the page and search for a Unit suited just to you! Gaming magazine PC Gamer shared an article mapping their most favorite game expansions. To our delight, Arma 3's recently released Apex expansion is listed as well (along with a short description). We're proud to be present among such PC game legends! It looks like Apex is also quite popular among streamers and their viewers. TwitchCon has shared a tweet uncovering the top ten list of most streamed 2016 releases. Arma 3 Apex is present there on the sixth place. We're really happy to see Apex doing very well and we're highly motivated to continue improving the game and work on new content. Thanks for the splendid support! In one of the recent Dev-Branch updates, we've removed the possibility to set the aspect ratio of the User Interface of the game. Senior Designer Bořivoj Hlava explains some motivations behind this decision: "The 'Aspect Ratio' setting helped users to run the game on non-standard resolution monitors in the past. These days, however, there is no need for this setting and it can even be misleading for some people. In fact, our Analytics data show that more than 10 % of our players have their aspect ratio set incorrectly which can significantly impact their experience of the game. Therefore, we decided to make things easier to understand by implementing a fully automatic aspect ratio detection into the game." Users of the official Feedback Tracker may have noticed some recent additions to the bug reporting site. Our QA heroes have now added two new projects: Arma 3 Security and DayZ Security. Naturally, we'll cover the part related to our project. Arma 3 Security is a new space used to report security issues (such as hacks, exploits and vulnerabilities) by our players directly to the developers. We're keen to hear about any exploits, potential security issues, memory hacks and others. Having a dedicated place for such reports on the Feedback Tracker can serve this purpose well and speeds up the process of tackling game-breaking issues and exploits. Be sure to check the initial description before submitting a ticket. There are some cases we're not able to influence and those should be reported to our partners (such as bans issued by BattlEye) or the standard Feedback Tracker section. The members of the Quality Assurance department are looking forward to the reports! The Tools package received a small hotfix due to an issue with the Publisher. You can inspect the full TECHREP on the Dev-Hub and provide your feedback to the forums or on the Feedback Tracker. Last but not least, the Bohemia Store is running a sale, with massive discounts on several Bohemia titles - including 50% off our beloved Arma 3, and the Arma 3 Karts, Helicopters, and Marksmen DLC (or even a combination of these three in the Arma 3 DLC Bundle). Grab your desired titles while the offer lasts! On September 27, 2016, Vojtech Kovaric has reported a SITREP #00175 on the official Arma3 site. Last Thursday, along with Tools Update 1.02, Arma 3 received Update 1.64. While the development team is evaluating the feedback from all possible sources, we're also focusing on finishing a more robust and final roadmap, which outlines the future of Arma 3 in the upcoming year. We hope to share the roadmap with our community in the next few weeks. Weekly Photo #50 shows Audio Lead Jan Dušek preparing to sow another batch of his beloved chili pepper seeds. The Audio office can turn a little heated from time to time. The secret Jan tells us is to keep a bottle of milk nearby in case things go hot (and they do with the North Carolina Reaper). We're looking forward to sharing the results of the chili season in one of the future Weekly Photos! A splendid Arma machinima video was posted on YouTube by Hololand. Introducing a stunning video footage in 4K resolution, Hololand managed to capture extraordinary moments while avoiding any post processes or color corrections. Shots of Tanoa are accompanied by moving units and vehicles truly give away the scale and complexity Arma 3 can offer. For those who consider 4K resolution ordinary, we're showing the image which landed on the r/gaming subreddit earlier this week. Again, the essence of Arma is perfectly captured in this 5K picture. Kudos to the author and GamingPC.TUBE for bringing it out on Twitter! The battle does not end here, though! Community member Greenfist released a picture with an insane 8K resolution. It captures Georgetown, the capital of the Horizon Islands. As Greenfist explains in the comments on the Arma subreddit, he actually compiled the picture out of multiple images. As a result, a splendid picture full of nice details and Easter Eggs and something to remember. Kudos to all three authors for their high-res contributions! Last week, we've released Update 1.64 on Steam (along with the Tools update). Bringing several performance improvements as well as low-level changes to the AI driving, we hoped that the extended period of public Release Candidate testing would help us discover any major problems which would affect the release. Unfortunately, not everything turned out to be splendid. We've released a small hotfix the day after (changing the way Launcher checks for addon signatures) and are still evaluating further actions, which might graduate in another hotfix to the game. The performance degradation bug (low FPS until a game restart) was unfortunately not fixed in 1.64. Even though a number of players reported not encountering the issue in the RC builds, it does not appear to have been solved for everyone. Our programmers are trying to tackle it and hope to have a solution soon. While we were unsuccessful with reproducing the issue in our studios at all and the special Performance Profiling builds have not revealed any relevant information, we are not abandoning the issue and still actively pursuing a fix. Everybody is of course encouraged to submit details to the Feedback Tracker, any information might help! An overhaul to the audio engine, released along with the Eden Update, has received a public documentation on the Community Wiki. Being a significant step forward in terms of audio simulation and features, Audio Lead Jan Dušek in cooperation with the community member Megagoth have created a thorough list of the new improvements as well as a guide and examples of how to use them. Kudos to both of them! Next station: Visual Upgrade documentation!